Next day, Monday, it was decided to visit Holenarsipur, a village about 1½ hour from Bangalore, where the main centre or karyalaya had been built, as it was detailed in part 4 of this travelogue. First, our taxi driver and friend (by now) Ravi, drove us to the house of a second Ravi, the one who is in charge of the first karyala of Bangalore. The latter presented us to his wife – both of them living in a comfortable and well-furnished house – and had tea along with a congenial conversation, where we talked about our country, Spain, and the circumstances that brought us to India. I congratulated the lady of the house for her good taste and the beauty of her two daughters (we only saw them in two photographs on the wall of the room where we were sitting – that is, the sitting-room). After one hour or so, we proceeded to Holenarsipur on a fairly narrow road not lacking a number of not-quite threatening shallow pot-holes and medium to small-sized stones. To our driver, Ravi, this was normalcy itself. Once in Holenarsipur, which I thought was a small village (never saw the village), we went directly to the enclave of the karyalaya, an open and attractive space with a few trees and an atmosphere of quietude. 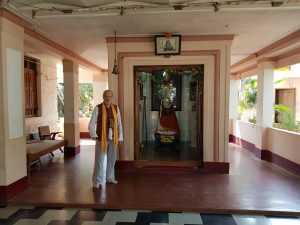 There were two two-story high buildings facing us, the Samadhi of Swamiji being placed within a small structure on one side and perpendicular to the two larger buildings. At the other end there was an enclosed area serving as an eating facility with a couple of tables and some chairs. Before proceeding further, we stood quietly and still in front of the Samadhi. As we approached the two buildings in front we came close to Sw. Prakashanandendra, who was standing to the left of us accompanied by an Italian family of three; we only greeted the group from a distance so as not to disturb them. 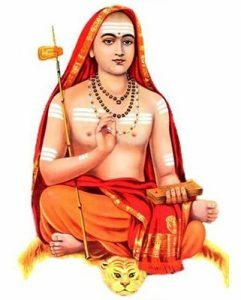 Somewhat later my wife found out that the family are disciples of that Swami and visit him in India from time to time. We then entered one of the two buildings where rows of large wooden structures standing on the floor shoulder high had piles of books of different sizes on them. I bought quite a few of the books. A frugal lunch was then served in the eating area mentioned above. A family of four – grand-father, grand-mother, one daughter and her two young daughters – sat beside us. The elderly man told me that they were from Rajasthan in the North, and that they were quite happy to have come to this place after a few years since their previous visit. I half-understood that he was either a disciple or a follower of Swamiji. Soon after that we took again to the road with Ravi and his taxi, who elected to go along a secondary road to avoid heavy traffic. The destination was Mysore. Again potholes and variegated stones strung around on the road… for another three hours while traversing many small villages. Just before arriving to the city there was a temple with a statue of Shiva lying o the ground; we decided not to stop to go to the inside, since we had to find a hotel. The adept Ravi soon found a suitable one, called ‘Dharma’ which was large and ‘comfortable’ though without air-conditioning (thus not expensive). At night I felt a little cold, but there was no extra blanket, so simply folded the bed-cover and its underlying sheet in two to cover ½ to ¾ of my body. The temperature outside the hotel cannot have been cold, though, given the time of the tear. This entry was posted in Uncategorized and tagged Holenarsipur, Karyalaya, Mysore, samadhi by amartingarcia. Bookmark the permalink.